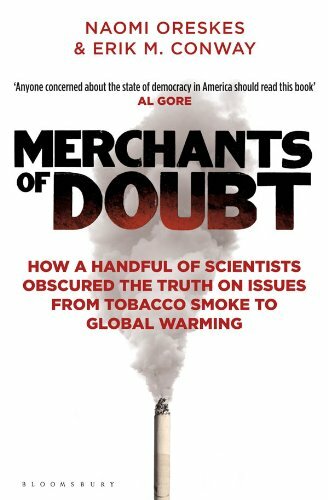 I recommend people read a book called Merchants of Doubt. All they need to do is create doubt. Now a powerful documentary from the acclaimed director of Food Inc., Merchants of Doubt was one of the most talked-about climate change books of recent years, for reasons easy to understand: It tells the controversial story of how a loose-knit group of high-level scientists and scientific advisers, with deep connections in politics and industry, ran effective campaigns to mislead the public and deny well-established scientific knowledge over four decades. The same individuals who claim the science of global warming is "not settled" have also denied the truth about studies linking smoking to lung cancer, coal smoke to acid rain, and CFCs to the ozone hole. "Doubt is our product," wrote one tobacco executive. These "experts" supplied it.